Railroad Beginnings in the U.S.
Transporting goods was the driving force in the development of railroads in the United State. Trains could potentially reach more markets faster. Some of the early railroad cars were pulled by horses. The first railroad that was constructed for the transportation of freight and passengers in this country was the Baltimore and Ohio. Fifteen miles were opened on May 15, 1830. The Fitchburg Railroad, chartered in 1843, was opened to Fitchburg on March 5th, 1845. Investors worried that there would not be enough profits. 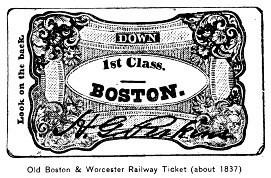 However, the Fitchburg Railroad began to pay well, very soon after its completion. Extending the rail line to the West required drilling the Hoosac Tunnel. Drilling began in 1851 and was completed in 1876. It was sold to the Fitchburg Railroad Company along with the Troy and Greenfleld Railroad by the State of Massachusetts in 1887. By 1896, the Fitchburg Railroad Company had obtained the Vermont & Massachusetts, the Boston, Barre & Gardner, the Troy & Boston, the Cheshire, and the Boston, Hoosac Tunnel & Western. The company also owned 204 locomotives. In 1900 the Boston & Maine bought the Fitchburg Railroad. Today you can ride a commuter train from Boston to Fitchburg operated by the Massachusetts Bay Transportation Authority. 1. What is the percentage or growth rate from 1829 to 1830? 2. What is the percentage or growth rate from 1830 to 1840? 3. What is the percentage or growth rate from 1840 to 1850? 4. What is the estimate of the growth rate for 1850 to 1860? 5. What is the total growth rate between 1829 and 1856? 6. Predict the percentage of growth for 1860 to 1870. 1. If the train to Fitchburg traveled 15 mph and the distance was 30 miles, how long was the ride for Henry's friend? How many miles per hour would the train travel? 1. If the distance from Concord to Fitchburg, Massachusetts is 30 miles and the cost of the ticket in 1845 is 90 cents, how much did it cost per mile? 2. If the distance from Concord to Fitchburg, Massachusetts is 30 miles and the cost of the ticket in 2001 is $3.00, how much does it cost per mile? 3. Compare the cost in 1845 with the cost in 2001. A checking system was invented to keep track of luggage being transported on the trains. Metal disks or checks were placed on each item and a duplicate given to the passenger. At the final destination, the check was presented to claim the luggage. The example on the left is a "through" tag. The item traveled over several railroad lines. The manufacturer's mark is also stamped on the check which was a common advertising practice during that time period. "The Fitchburg Railroad touches the pond about a hundred rods south of where I dwell. I usually go to the village along its causeway, and am, as it were, related to society by this link. The men on the freight trains, who go over the whole length of the road, bow to me as to an old acquaintance, they pass me so often, and apparently they take me for an employee; and so I am. I too would fain be a track-repairer somewhere in the orbit of the earth." "One says to me, 'I wonder that you do not lay up money; you love to travel; you might take the cars and go to Fitchburg today and see the country.' But I am wiser than that. I have learned that the swiftest traveller is he that goes afoot. I say to my friend, Suppose we try who will get there first. The distance is thirty miles; the fare ninety cents.... Well, I start now on foot, and get there before night;... You will in the meanwhile have earned your fare, and arrive there some time tomorrow, or possibly this evening, if you are lucky enough to get a job in season. Instead of going to Fitchburg, you will be working here the greater part of the day." The Evolution of the American Locomotive.